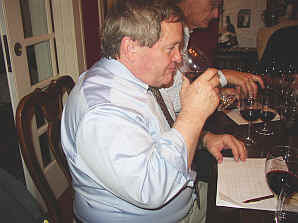 Founding Vino Fino taster John McGlothlin spent a day "researching" the theme for this tasting by cruising Sonoma's Russian River Wine Road in search of Zinfandel. 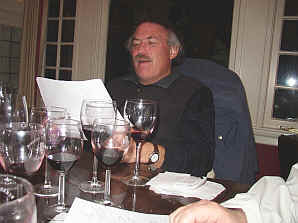 He assembled an interesting set of wines from a variety of producers and treated us to a little taste of Vino Fino "history" at the conclusion of the evening. 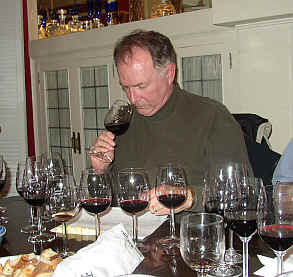 While most comparative tastings are more "fair" when the wines hail from the same vintage, this tasting provides a snapshot of wines currently being offered for sale by various producers. There was one wine which outdistanced the field by a significant margin. 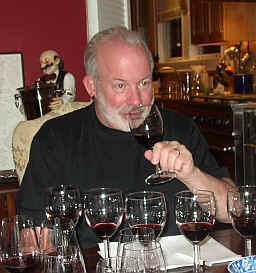 But six of the eight wines had a first place vote and half the wines had at least one last place ranking. Here's a good example of why this winery has had its difficulties in staying financially afloat: a weedy, herbal, woodsy, stalky Zinfandel with plenty of tannin but little in the way of charm. The flavors are reminiscent of bitter green tea. Poor. This wine displays "older," somewhat mature notes on the nose. It's mildly briary and minty, but comes across the palate as a bit shy of fruit, yet somewhat hot, coarse and tannic. Standard quality. 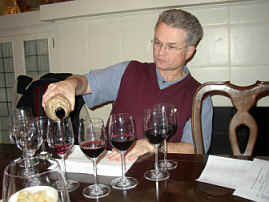 Here's a wine which features some of the dehydrated fruit elements of many Zinfandel wines. The grape ripens unevenly, so great care is required if you wish to avoid the raisined elements often found in Zin. This wine has a bit of spice and cocoa to go along with the raisined fruit. I gave it a half-star rating on my three-star scale, no stars being standard (or worse), three stars being exceptional and classic. Here's a wine that successfully avoids the raisiny and over-ripe fruit notes an captures the raspberry and sweet spice notes of Zinfandel. I was, apparently, the only real fan of this wine. It sports a floral tone in the nose, as well. Very bright, youthful and fresh. Lovely on the palate, being berryish and dry. Probably best enjoyed in its youth. I gave it two-and-a-half stars. If you enjoy a York "Peppermint Patty" candy, this is your Zinfandel! It features lots of chocolate and lots of mint. Very jammy and showing over-ripe fruit. One star. While this wine offers some cocoa notes, it never goes over the edge with raisined fruit elements. There's a pleasantly spicy quality to the nose which displays a hint of cola, too. 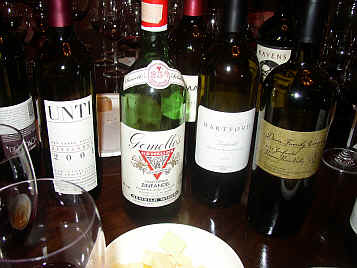 The same flavors are present on the palate, making for a rather nice wine. Two stars. I was not as charmed by this as were others, though nobody ranked it first. 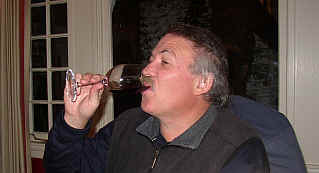 It's really ripe and briary, showing a ton of tannin and it's hot and coarse on the palate. I gave it a half-star rating. There is certainly a ripe note to this wine, but the fruit retains its berryish vitality and a bit of spice. 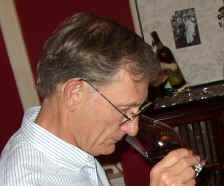 The nose is quite complex and the wine shows well on the palate, too. The balance of fruit and tannin is good, suggesting it may be held for two to four more years. I gave it two stars. The undisputed Vino Fino Zinfandel champion! 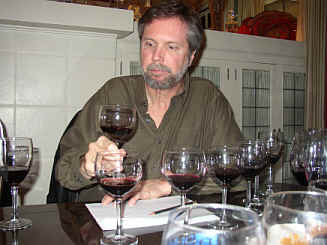 Back in our early days, this wine won virtually every Zinfandel tasting into which it was entered. 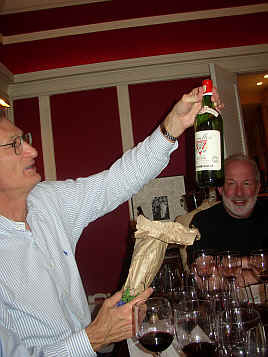 John McGlothlin was kind enough to share his last bottle of this wine with us. It was still a shade tannic on the palate, but displayed a lovely deep Zin character and provided us with a little taste of Vino Fino history.